I got back to "Sarah Elizabeth Brooke" after I finished Sergei. 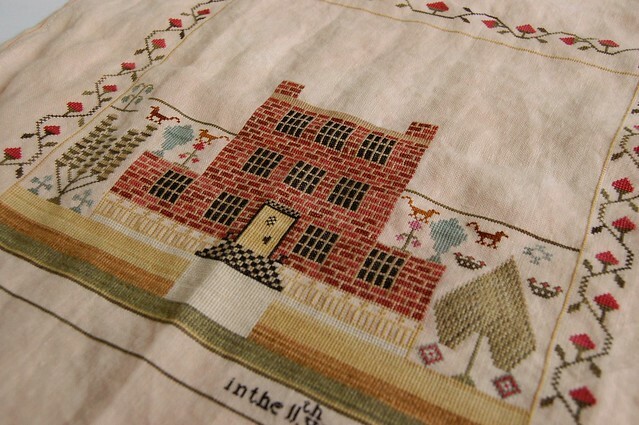 I finished the house a few days ago and just finished the border last night. The bricks in this piece are so realistic...beautiful job! Lovely progress! I agree with Peggy Lee, those brick look so real. Just beautiful Nicole...wrinkles and all! LOL! Wow, it looks wonderful! Great progress! How very pretty, its coming along so fast too! Nicole, what a pretty sampler! You are doing a beautiful job, as always. The colors in this one are so pretty. I've given up on excusing my wrinkles. They're always there. lol! Great progress! I'm working on the over one at top. It's going better than I expected! She's beautiful Nicole! I need to get back to mine. This is gorgeous Nicole. What a lovely sampler. Well look at you.... looks like you have your stitching mojo back! Beautiful design. Can't wait to see your next update. Mmmmm so beautiful Nicole! You must be so happy with this project! The brickwork and border look lovely. You're making great progress. That did it. This is just amazing. Even if I never stitch it, I have to have it. This is looking beautiful Nicole!! Wonderful stitching!! Love the look of the silks. It is looking gorgeous! 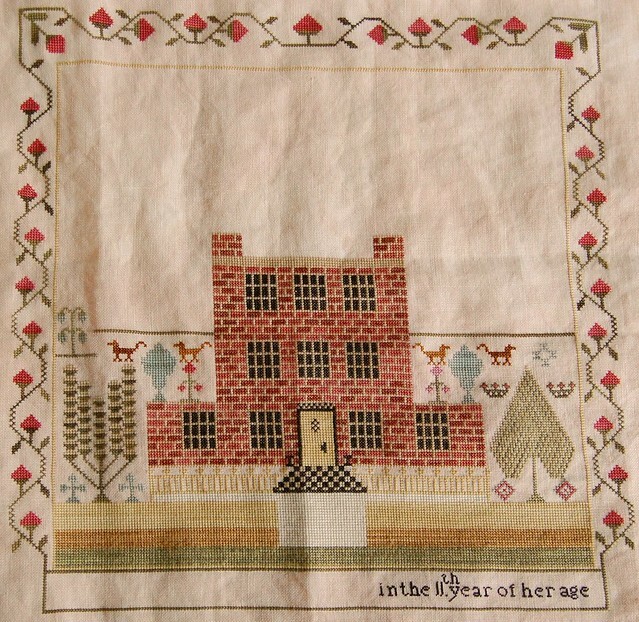 this is a gorgeous sampler. Lovely progress - she's a beauty! It's beautiful, Nicole - I love the border! You're making nice progress! Beautiful job on finishing the brickwork! The piece is looking gorgeous. Your making good progress, the bricks must be a real challenge. This is such a pretty design and a lot of people are stitching this one right now. I'm enjoying seeing everyone's updates. The bricks are very realistic looking. Gorgeous sampler and I love the colors!!! Beautiful Sampler, the colours are amazing. New follower here! I just love your blog. Thanks for the inspiration!! Based on watching you do this so far I've just decided she is my next project to save for and buy! Cannot wait to see more of yours and start on mine! Sarah is looking beautiful, such great progress.